← Who’s Fired up to See Philip Rivers’ Mustache Tonight? I dare you to say that’s not the sweetest throwing motion in all the land. Chargers win!! It was the Chiefs, so everybody just calm down. A nice win for the Bolts, sure. 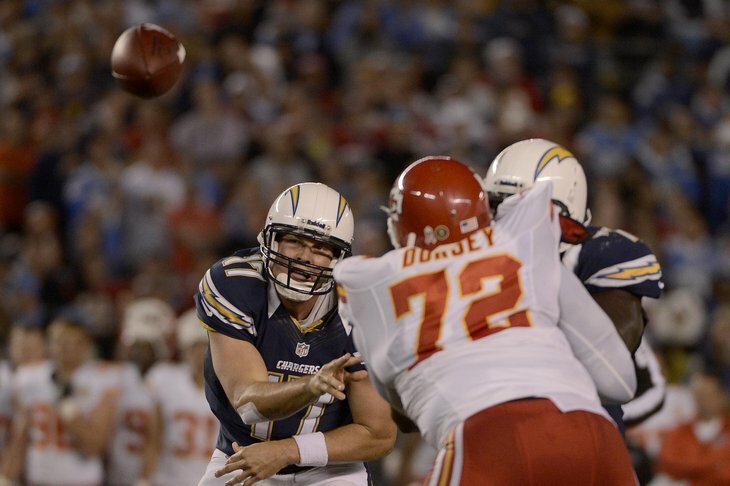 Shuts the critics up about firing Norval for a week, and Philip Rivers did a good job at shutting up the critics too. With his 90% completion percentage, became only the sixth QB to ever post one of 90% or higher. He did it on 20 attempts and tied for the fifth-highest of all-time with Steve Young. Impressive. Too bad he threw that laughable INT in the end-zone that took points off the board for the Bolts. I did hear him say in an interview after the game, “That ball should have been a souvenir for a fan in the stands.” He knew he had no business making that throw. Now, if you will, a moment of silence for Rivers’ shaved mustache. It may have left Philip’s face, but it will never leave my heart. This entry was posted in Football, NFL and tagged Chargers, chargers chiefs, chiefs, Philip Rivers, philip rivers mustache, philip rivers throwing motion. Bookmark the permalink.